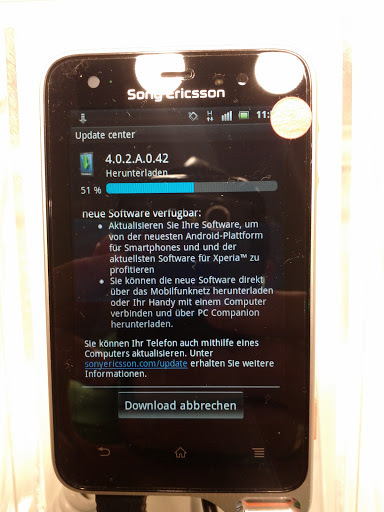 Droyd Cantina: Oh no, it's not Android 4.0.2 on the Xperia Active. Oh no, it's not Android 4.0.2 on the Xperia Active. For a moment I thought, I'll see Ice Cream Sandwich on the Sony Xperia Active. But nope. It's just the Sony Software. Bummer. But ICS is coming soon according to Sony. I'll hope sooner than later. And I'm curios how the Sony UI will integrate. It's not bad at all, but differs a lot from the original vanilla stock Android UI. And yes, it's okay to call it Sony. They recently took Sony Ericsson completely and now branding with a new name. So Sony Ericsson is no longer, it's Sony. Now I hope the Manga-char of Sony Eri-chan isn't gonna be renamed, too :).